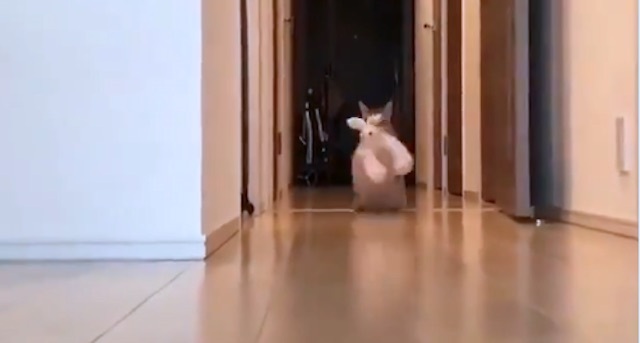 A strange creature marches deliberately and menacingly down a hall towards the camera. It could be anything for a while until you realise what it is all about. This entry was posted in Video and tagged cat video by Michael Broad. Bookmark the permalink. I enjoyed it. He’s got his teddy and no one is going to take it off him. So funny! Cats are so amusing. I bet someone with the software know-how will hide the cat’s head until the end; even funnier. Bunny monster. Yes, I couldn’t tell what was happening initially.